Arranging for strings is not an easy task. Writing and creating arrangements for real, living and breathing string players is an art, but it’s a skill worth learning. Because when it comes to lyrical expressive power and sheer percussive bite, a string section is one of the greatest musical tools in the box. There are many things to consider when writing arrangements for string quartet or string orchestra. But let’s be pragmatic and start with cost. A 24-piece string orchestra would be great, but it’s not always affordable. A string quartet, however, is within budget. Expand this to a quintet by adding a double bass, overdub a couple of times and your track has the potential to strike pure gold. So how to write string arrangements? We can’t cover everything here, it is a long study after all, but here are a few very useful tips guaranteed to improve your arrangements. 1. It’s better to write each part separately – your arrangement will sound more like a living string ensemble. 2. Each line should be able to stand alone. 3. Choose the right key signature. 5. Don’t forget that a small string ensemble can be forcefully percussive as well as lyrically melodic. 6. Steer clear of unison passages for the two violins. 7. Don’t get too dictatorial about the bowing in your arrangement. 8. Ask the musicians if you’re unsure about any aspect of your string arrangement. If you’re using MIDI to do your string arrangement, your instinct is probably to take a chordal rather than a melodic approach. But actually, when it comes to a small ensemble – or indeed any instrumental arrangement – it’s far better to write each part separately. Admittedly it’s more work, but it’s worth it. Your arrangement will sound less like a string patch and more like a living string ensemble. Each line should be able to stand alone. Rather than writing a series of block chords where everyone changes note at the beginning of the bar, introduce independent melodic movement. You give the player a chance to add expression. It varies the ensemble sound and helps the music breathe and come to life. Your arrangement will sound dull if the 1st violin always has the tune, the bass line is the exclusive territory of the cello or double bass and the 2nd violin and viola continually chug away in the engine room. All cellists love a good tune. Put it on their A string and they’ll probably buy you a beer after the session. While the cello is singing, mix things up by giving the bass line to the viola. Don’t forget bars rests. You may only have a small handful of musicians, but this doesn’t mean that each player needs to play in every bar. You’ll create a much richer, more varied texture if you use solos and combinations. Generally speaking, string players prefer keys with sharps rather than flats. In short, they find them easier to play. A good rule is to write in keys which match the open string. It’s no coincidence that some of the most famous concertos in the world were written on the open string keys. After all, Bach, Mozart and Beethoven knew what they were doing. In a string arrangement, the simultaneous ringing of open strings can create a gorgeously full and resounding effect. You’ll notice that there’s a lot of overlap between instruments. The viola, which is pitched a fifth lower than the violin, can sound great higher up within the lower violin range, while all 5 instruments are capable of covering the G3-G4 register. We’ve already mentioned the value of a good cello tune, but don’t forget about the double bass. It may look like a large piece of furniture, but this instrument has potential melodic beauty. Never forget that it has a bow. Limit it to the basic pizzicato bass line and you’ll be wasting an opportunity. Having said this, be careful where you put that tune. When you’re writing for any instrument via sampled sound, it’s easy to end up impossibly high or impractically low. Your keyboard won’t care, but your real-life musician will. Unless there’s a good musical reason to do so, avoid the violin’s stratospheric top notes (above A5). It’s great for repeated notes or tremolo, but your violinist won’t thank you for a lush melody in that range. On all string instruments, the extreme low register can sound wonderfully rich and throaty. Vibrato isn’t possible on open strings though, so bear this in mind when you’re using base note open strings (C2 on cello, E1 on double bass etc). Musical sound is, obviously, one of the most difficult things to describe in words. Rimsky-Korsakov, a composer who knew a thing or two about instrumental arrangements, came up with the following in his book “Principles of Orchestration”. We’re not suggesting you use all of these in one single arrangement. But it’s worth knowing that a small string ensemble can be forcefully percussive as well as lyrically melodic. 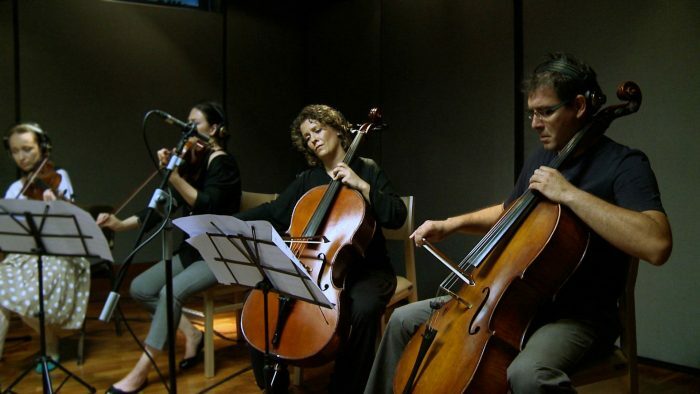 A good string arrangement can also make a few musicians sound like a much larger group. A strong pizzicato line in the cello or double bass, for example, when combined with legato lines elsewhere, sounds beautifully lush. And while vibrato is one of the characteristics of string playing, you can create a strikingly cold, icy effect if you ask the entire ensemble to play N.V. (non vibrato). At this point, we’d better mention tuning. While larger string sections can actually benefit from tiny intonation discrepancies because it creates a `chorus’ effect, small ensembles most definitely do not. Steer clear of unison passages for the two violins – which is, in any case, wasting an instrument – and avoid large leaps between notes for all players, especially if you’re asking them to leap upwards. Talking of tuning, be careful with the double stops. If you’re asking your string player to play two notes at once, make sure these are in thirds, sixths or tenths. If you make them double-stop in fourths, fifths or octaves they’re likely to throw something at you. If you’re in any doubt, avoid it. Muted strings can make a hauntingly ethereal sound, but if you want your string quartet to play con sordini (with mutes), give them at least 2 bars rest to put the mute in. Similarly, allow time to change between arco (bowed) and pizzicato passages or you may end up with bows flying about all over the studio. While we’re on the subject of pizzicato, make sure you’re being realistic about the pitch. Generally speaking, don’t write pizzicato too high in the instrument’s range. With violins, for example, it’s more resonant if you stick within the treble stave. As anyone who’s worked with real-life string players will know, bowing is a minefield. The most useful piece of advice about bowing is this: leave it to the musicians. Professional string players like to be flexible with bowing, except in large sections where they’re all doing the same thing – and in these circumstances it’s up the section leader. So don’t get too dictatorial about the bowing in your arrangement. Generally speaking, it’s for discussion between the players rather than the arranger. In the end, if you’re unsure about any aspect of your string arrangement it’s best to ask the musicians themselves. They’ll happily tell you if you’ve written anything which is tricky, impractical or unplayable. Alternatively, you could always get in touch with us and have our world-renowned string arrangers provide all the support you may need. Useful for me. I am starter in string arrangement though been playing ? for quite awhile. Thank you! Thanks for this useful summary. When notating the instruments’ ranges, I’m accustomed to seeing Middle C as C4 (rather than C3 as in this article). Under that system, all octave numbers would be one higher than indicated here. For example, the violin’s range would be written G3-E7, and the ‘cello’s would be C2-G5.